Yesterday, I have finally received results for my Final Exams of CS101 Udacity course. I did it! I have successfully accomplished that course, received the certificate with “High Distinction”. To be honest, I thought it would be “Highest Distinction”, since I was pretty sure about correctness of all my solutions posted. But reality is different, you can never be sure. Next time, I’ll probably put more attention to verification of my code. Nevertheless, here is my certificate. I’m really happy that I managed to make this happen. It’s probably nothing to proud for, but I feel much motivate for further Udacity courses. As I said in previous post, I enrolled for next ones on statistics and algorithms. Hope I will be able to go through them, with at least same results I got for CS101. 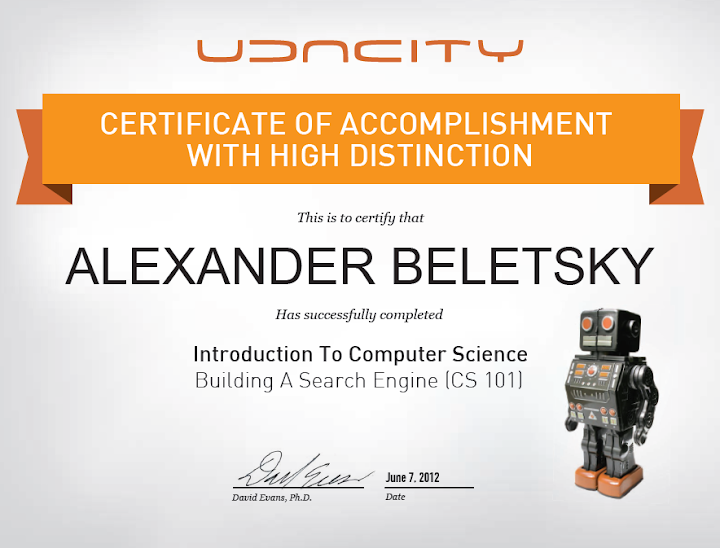 Once again, thanks to Udacity for such great opportunities.